It's not often you get to sit with an iced drink in the sunshine and look out on 180 degrees of tropical splendour with twinkling bays left and right and palm-coated hills rising from the valley below. At Alpha Villa you can't avoid it and the upper floor lounge and pool terrace alone is a perfect spot to spend a relaxing few days. If you sleep in the comfortable master bedroom next to the pool, you may never bother venturing into the villa’s rather cavernous lower levels. That's not to say guest bedrooms downstairs are disappointing - all four are quiet, private and slide open onto beautifully landscaped gardens. Families or groups of friends will enjoy this villa because it offers plenty of options to combine shared time with more private moments. Gathering in the TV room on the middle floor is like a trip to a laid-back cinema and it's easy to lose track of time in there, day or night, as you recline on the comfy cushions in air conditioned bliss, catching up on your movie back log. But up on the pool deck is still the best way to lose a day; floating in the pool or gazing at the view. Although there are a lot of steps to negotiate between floors (not ideal for seniors), the kids have plenty of space to explore and play safely (as long as you keep an eye on them around the pool area, which drops off sharply). 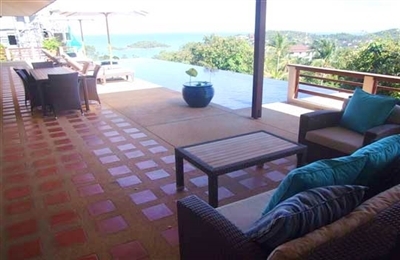 Alpha Villa is also one of the few hillside properties on Samui that's genuinely convenient for trips to the main beaches and tourist attractions (although a car will be necessary). Efficient but unobtrusive staff and a wide range of optional services give you the freedom to be totally independent but also to spoil yourself with in-house indulgences like a private chef or daily massage if you so choose. This is a great location, with versatile facilities and breathtaking views, as long as you don't mind a steep drive.